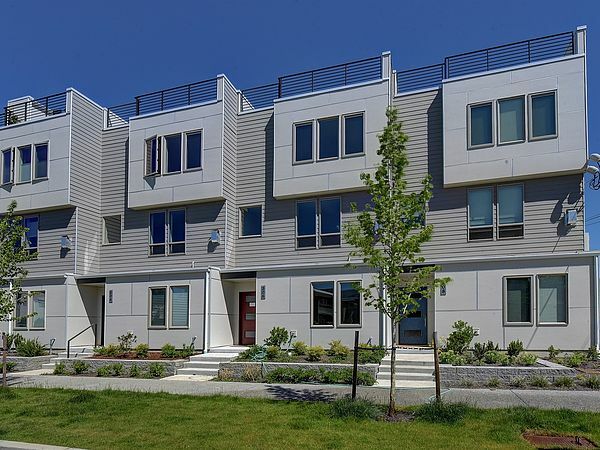 Artfully Designed Contemporary 3 Story Homes Sporting The Ultimate In Smart Design While Combining Luxurious Light and Bright Living Spaces Enjoying Upgraded Finishes like Steel Railings, Quartz Counters, Gas Fireplace & More!!! ¨ You will find exceptional value offered in these rare new contemporary 3 bedroom, 3.25 bath homes enjoying all that Broadview has to offer. ¨ Extensive use of hardwood floors on the main floor, in the kitchen, dining room and great room. ¨ Gourmet kitchen, with attractive stainless steel appliances, beautiful wood cabinets, quartz counters, all overlook the living room with a wall of windows and a contemporary gas fireplace. ¨ The 1st floor boasts tile and carpet floors, a 3/4 tiled bath with rain shower and a spacious bedroom. ¨ The 3rd floor enjoys the master suite with a luxurious bath with rain shower head, a separate shower wand in the large and beautifully tiled shower. ¨ Great territorial views from the sunny roof deck which also offers water, power and a gas hook-up for your BBQ.